On behalf of the UT Health San Antonio School of Health Professions, I am delighted to announce the appointment of George Kudolo, Ph.D., FAIC, FAACC as the Chair of the Department of Health Sciences. Dr. Kudolo currently serves as the Interim Chair of the Department of Health Sciences and as Professor with Tenure. Involved in the education of health professionals since 1987 at UT Health San Antonio, Dr. Kudolo has been committed to promoting the scholarship of teaching and learning and has mentored and directed many students at the graduate and doctoral level. In recognition of Dr. Kudolo’s excellence and dedication to teaching and learning, he has received numerous awards to include the Regents’ Outstanding Teaching Award, UT Health San Antonio’s Presidential Teaching Award, American Association for Clinical Chemistry Outstanding Speaker Award, and the School of Health Professions Distinguished Teaching Award. In addition to his current service, Dr. Kudolo has received numerous research grants and has presented at many conferences around the world in his field. He was recognized as the first scientist to demonstrate the ability of ingested Ginkgo biloba extract to induce pancreatic insulin production. Committed to furthering research in Medical Laboratory Science, Dr. Kudolo has published many journal articles and abstracts in peer-reviewed journals on topics including clinical chemistry, toxicology, alternative and complementary medicine, reproduction, nutrition, and diabetes. In recognition of his excellent achievements in research, the George Kudolo Award for Research is given to outstanding School of Health Professions faculty every year. Dr. Kudolo’s leadership in service to the profession, institution, and school is evidenced through his involvement with many organizations, committees, and task forces. Included in these are the National External Advisory Board on Alternative and Complementary Medicine, American Association for Clinical Chemistry, and served as past Chair of the UT Health San Antonio School of Health Professions Promotion, Tenure and Appointments Committee. 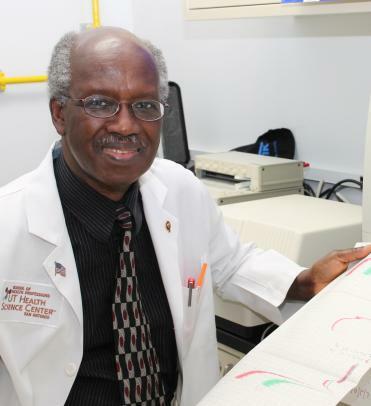 Dr. Kudolo is certified by the National Certificate Commission in Chemistry and Chemical Engineering. Please join me in congratulating Dr. George Kudolo on his new role as Chair of the Department of Health Sciences.